Customers are facing challenges with data migration scenario, where each customer/partner has to write custom code or use 3rd party tool to import large volume of data. To help alleviate this pain point, Microsoft Dynamics team has developed a cloud Data Loader service for Dynamics CRM online. The key benefit of this service is the ability to move your data between flat files and CRM online, and cut down on implementation costs. We’re pleased to announce preview of this service that will empower organizations to better manage their data import/export processes. The preview supports only import operation, and the export will come in the next update of the feature. 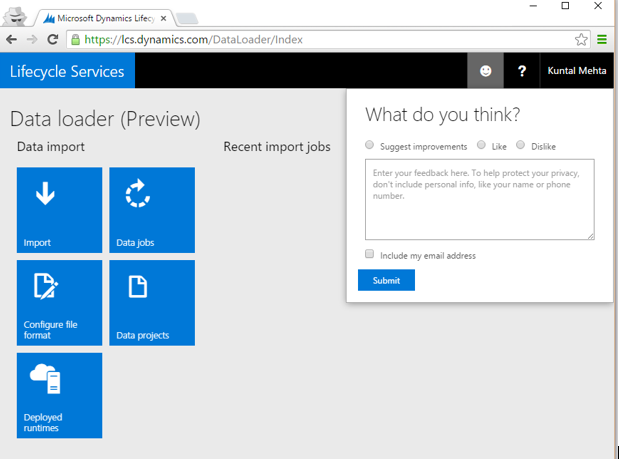 This new Data Loader is available as a preview to North American based Dynamics CRM Online organizations. It supports CRM 2015 Online Update1 and the upcoming release. In this post, I will be sharing the following high level topics for the Data Loader. Click on Sign in and enter your CRM administrator credentials. This will log you in the service, and you are ready to use. For detailed walkthrough of how to use this service – refer to Walkthrough of Data Loader blog post. We are making this preview available so that you can try it and let us know what you think. Your feedback will help us prioritize work to include the capabilities you need most. We ask that you give us your suggestions, questions on how to and report problems from right inside of the Data Loader user experience, it’s the Smiley feature as shown below. Please make sure to add your active email address in the text box to ensure we can connect with you.